Works very well with vanilla mannequins DOES NOT WORK WITH MODS THAT CHANGE MANNEQUINS. My goal hear is to be creative and inspire others with fresh ideas. I am a die hard NOOB when it comes to modding and honestly I'm impressed that I came up with one mod let alone two. These mods are simple replacements using vanilla from start to finish. They will accept any body, face, hair, detail, etc mod that you throw can at them. I have been do a lot of testing and a lot of testing (I also been do a lot of drinking) trying to figure out why they are flying and how to stop them. (Damn it if I cant fly then neither can they) I have managed to cut back on the flying (with a few tweeks) and will start releasing a 2.0 version soon starting tonight with Alva. Dovahkiin Hideout by Shawk http://skyrim.nexusmods.com/mods/12553 for my house LOVE IT. I don't expect much but do hope you enjoy my work and someone with real talent expands on some new ideas. Restutitor Orbis deserves credit for doing just that. 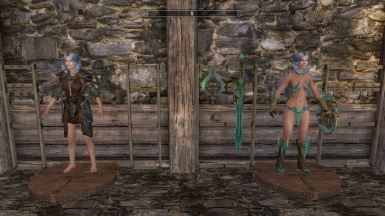 Oh yeah these Mannequins are so life like that they will look at you and talk to you when there corresponding NPC'S are next to them.